With a world so convoluted with musical talents and expressions, how does one get noticed? 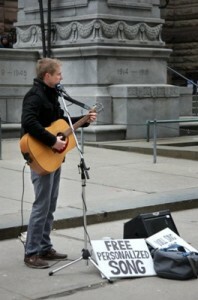 There are a few options such as recording your own demo, submitting it to record labels or even publishing it yourself. But if you are one of the few who wants to be “noticed” for their pure talent, then here is where you should start. 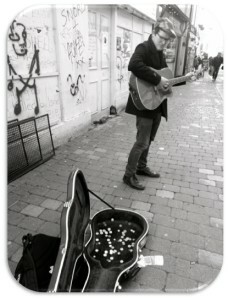 Find a cosy street corner that you know is going to be busy, set out a hat or that old guitar case and get playing. The simplicity of this is that you just belt out some tunes and hope you can be heard over the rush hour traffic. If you are able to, then plug yourself in and try being a little more noticeable about the bustling crowd. Do a few crowd pleasing songs, and of course a few of your won. Mournful ballads are not going to work in this situation – go for upbeat and perky if you can. The bonus is that you may also earn a little moola as passersby throw some cash into your hat or case. Inquire at local coffee shops, markets and pubs and see if they would be willing to let you sing a few tunes. You may not be their perfect taste in genre, so do a few covers. But do not forget to slip in a few of your own songs. And use this as an opportunity to gauge how well liked your songs are. Whatever happens, the main thing is that you are pleasing the crowd. Nobody is going to notice a miserable, unhappy and sorrowful musician. Play to the strengths of those around you, and they will be eating out the palm of your hands. 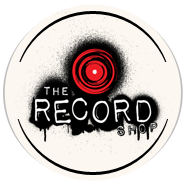 http://therecordshopnashville.com/wp-content/uploads/2018/10/nashville-recording-studio.png 0 0 Editor http://therecordshopnashville.com/wp-content/uploads/2018/10/nashville-recording-studio.png Editor2015-04-16 01:54:552015-04-16 02:04:24How to get noticed!